Bournemouth University (www.bournemouth.ac.uk) and The Game and Wildlife Conservation Trust (www.gwct.org.uk) are recruiting a high calibre PhD researcher to work on a three year fully funded studentship investigating changes in the migrations of Atlantic salmon in relation to factors including climate change, with an emphasis on how changes in smolt migrations are impacting survival to spawning adults. 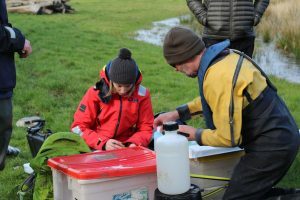 The study will develop flexible multistate state-space mark-recapture models to quantify and then investigate correlates of Atlantic salmon marine survival using data collected on the river Frome, Dorset UK, with the intention of generalising findings to other rivers in Europe. The successful candidate will have a strong numerical background and some knowledge of salmonids.